Polished concrete flooring is becoming an increasingly popular flooring solution in modern homes, retail spaces and offices due to it’s sophisticated and stylish look, durability, low maintenance, energy efficiency, environmental sustainable and slip resistant surface. 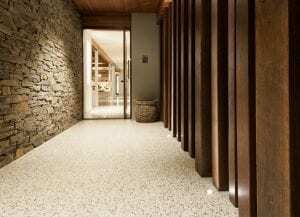 As polished concrete can be used both as decorative flooring as well as a structural surface, there are specific placement and finishing techniques required to ensure a quality finished project. Because of this, McGinn Concrete are the right company for the job due to our experienced trades people specialising in the placement, polishing and sealing of polished concrete flooring. 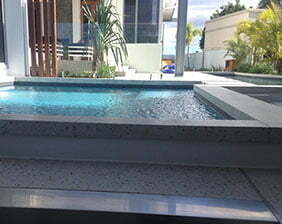 McGinn Concrete works in partnership with Boral Concrete, Excel Group, Hanson and CCS to give our customers the widest choice possible in creating your special design and variety from finishes including Husqvarna Hiperfloor, polished honed and sealed and different concrete colours and aggregate styles. Be sure to create your perfect look by viewing the various options explained on the website or contacting the team to discuss. Husqvarna Hiperfloor™ is a revolutionary flooring concept for the grinding and polishing of old and new concrete floors. Through market leading R&D strategies, Husqvarna has combined advancements in planetary floor grinders, floor treatment products and the latest resin diamond technologies to create a system whereby new and old concrete floors can be transformed into highly abrasion-resistant, incredibly dense, smooth and visually appealing surfaces. Read more about Husqvarna Hiperfloor™ finish styles. Imagine having a beautiful floor that flows seamlessly from your interior floors and outside to your entertainment area. If you love the look of a contemporary, designer floor that is hard wearing and can match into your interior spaces, then view our honed and sealed concrete finish page. 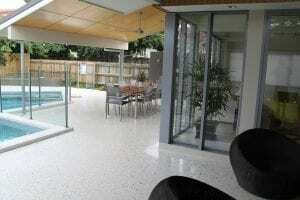 McGinn Concrete offers a large range of coloured concrete from the Boral range – Colori. There are a variety of coloured concrete tones that will inspire you to create an indoor or outdoor area that looks like a designer styled it. Check out the range here. What is the difference between Hiperfloor mechanically polished concrete and a grind and seal finish? 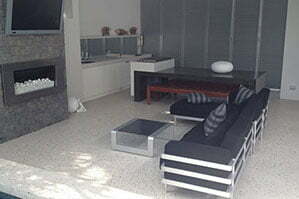 The Hiperfloor mechanically polished concrete floor is the authentic way of producing polished concrete floors. It is certainly a very high-end luxurious floor that undergoes a series of polishes to make the floor super smooth and shiny creating the glass like, high gloss effect. As a mechanically polished concrete floor does not have a coating over the top, it will last much longer than a sealed finish as there is nothing to ware away. 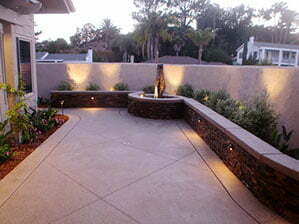 The grind and seal finish is a cheaper alternative ad involves grinding the concrete back before a clear coating is applied over the top which protects the concrete. Sealers will generally need to be re-applied every 2 – 7 years depending on the application. How do you clean a polished concrete floor? 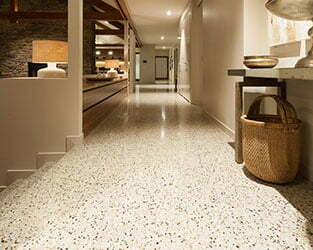 The beauty of polished concrete is that is very simple and easy to maintain. Maintenance is as simple as using a micro-fibre dust mop to clean dust every couple of days, and for a bigger clean, just use water. If desired, a PH neutral cleaner may be added to the water. Can polished concrete be used outdoors? Of course you can! For outdoor use however, we usually recommend using the grind and seal method, as we are able to apply a slip resistant finish to the floor as a safety precaution in wet areas around pools and outdoor areas. Is polished concrete a good option for allergies and asthma sufferers? 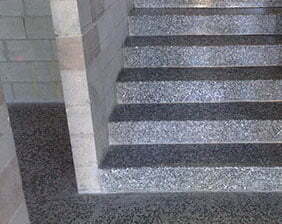 Polished concrete is a great solution for those who are prone to allergies and asthema. Unlike carpet, timer and a variety of other floor finishes, it does not support the growth of mould, or have fibers for dust mites to live.